As hinted at in a previous Ethereum World News report, notable crypto exchange CoinBene is under suspicion of being hacked after a sudden maintenance session. Interestingly, a report from Elementus, a blockchain analytics firm, would confirm this. Per the company’s recent report of the exchange, on March 25th, $105 million worth of an array of cryptocurrencies, namely ERC-20 tokens and Ethereum, were spirited out of CoinBene’s hot wallets into an array of addresses. Here’s a quick breakdown; $70.7 million worth of Maximine, $14.2 million of CoinBene Coin, $2.5M worth of Ethereum, and so on and so forth. 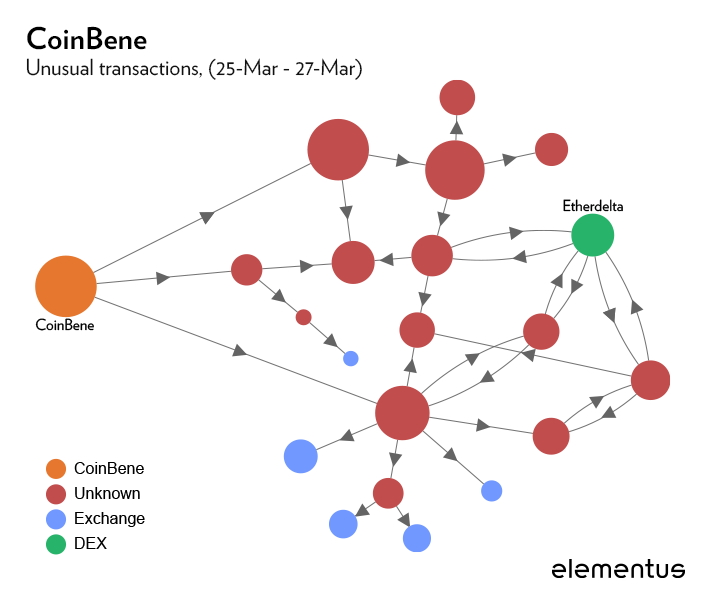 Elementus’ Max Galka writes that following these sudden transfers, Coinbene’s hot wallets were shuttered, with the remaining funds subsequently routed to cold wallets, thus leading the exchange into a sudden maintenance session. The sequence of events — large amount of funds withdrawn quickly, period of inactivity, remaining funds secured into the cold wallet — is consistent with how exchange hacks commonly play out. While Elementus seems to be postulating, this outlet would be remiss not to remind the reader that this data provider was the first to delve deep into Cryptopia’s ~$16 million hack, in which millions worth of Ethereum, ERC-20 tokens, and Bitcoin were swiped. In a tweet, however, CoinBene claims that it is entirely fine. It claimed that all assets on the exchange are “100% secure,” adding that its security team is actively monitoring anomalies at all time. It adds that the sudden maintenance session earlier this week has much to do with “taking measures to upgrade the wallet immediately” as a result of recent hacks, rather than a hack on their own crypto holdings. As reported by us previously, DragonEx, a Singapore-based exchange, was suddenly hacked. It isn’t clear who executed this attack, but all eyes are looking to Lazarus, a North Korean hacker group that has purportedly been racking up Bitcoin and other digital assets for the regime.